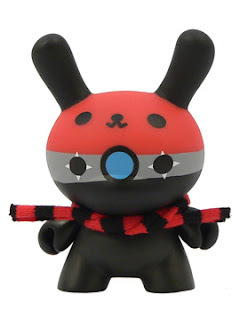 We are currently running a promotion where every order totaling $50 or more gets a FREE Kidrobot Series 5 Devilrobots Dunny. Also, we have a permanent new policy: All orders with subtotals of $100 or more ship for free within the US. 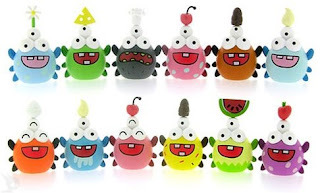 Our free US shipping policy extends to Hawaii & AK, so all you designer toy nuts in HI can take advantage of free USPS Priority shipping for any order above $100. $100+ orders within the continental US will usually ship with Fedex Ground for FREE. For up to the minute info on promotions like this, go to our website and add yourself to our email list. I emailed our email list about both of the above promos last week. Doktor A Mechtorians Series 1 by MINDstyle. Still have lots in stock! Friends With You Mr. TTT Rainbow & Albino versions, which are a couple of really big, amazingly beautiful plushies! Doktor A Mechtorians in stock & shipping now! 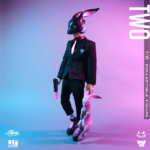 Another fine release by MINDstyle! 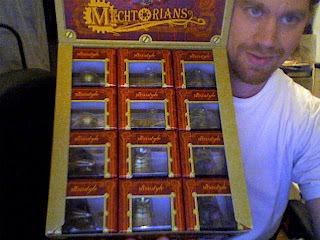 Mechtorians look awesome, packaging is first-rate, yet again. First time I've seen slide-out window boxes! Very, very happy with this series. All preorders are shipping starting tomorrow in the order they were received. The first dozen people who preordered Mechtorians will get a free toy included in the package as our way of saying thanks. Good luck to everyone, hope you find a Golden Ticket! By the way, we still have some Mechtorians left if you have not yet picked them up! 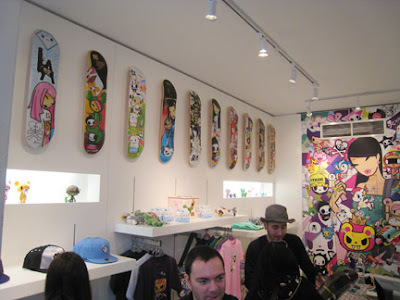 our visit to the tokidoki store to meet Simone! There was a small line of people still waiting outside to get their toys signed by Simone! We got there a little late, after 4, so we couldn't get on line for the signing anymore. We went right inside instead and met Simone, for the first time actually. 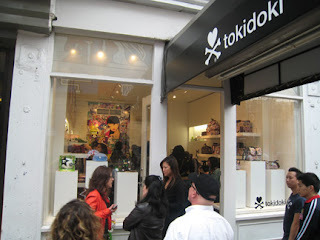 We've been selling tokidoki toys for about 3 years now and I've never shaken the guy's hand! Glad I got a chance to do that finally. He was very gracious even after having spent the previous 3 hours signing stuff for people. He actually had a few more people in line so I kept it short with him and let him get back to his thing. 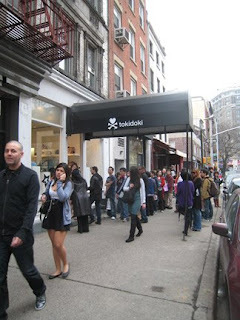 Another great thing about the Spring St location is its proximity to the Kidrobot store. You can definitely get your designer toy fix down there pretty easily. Also on the same street are the Mac store and Opera Gallery. Opera often hosts art shows by well-known toy artists. Last one I saw there was Ron English. I'd highly recommend a trip to Spring St if you live in NYC or you are close enough to visit. You could definitely make a day of it- plenty to see and do, and some cute places to sit down and eat. It also crosses Broadway at one of the busiest, most dense shopping areas of NYC. Lots of designer clothing stores and about a billion sneaker joints for all of you sneakerheads.